Franklin Matters: "many towns once used the river as a source power"
"many towns once used the river as a source power"
"Bellingham resident and author Marjorie Turner Hollman has just completed the third in her “Easy Walks” local trail guide series, Easy Walks and Paddles in the Ten Mile River Watershed, this time in partnership with the Ten Mile River Watershed Council. Members of the Ten Mile River Watershed Council worked together with Hollman to create this guide to 39 outdoor spaces in the towns that host the river. 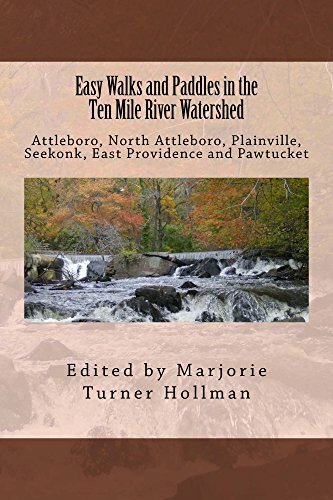 The series now covers 34 towns in south central and southeastern Massachusetts, and three Rhode Island towns along Massachusetts’ southern border -- more than 120 trails in all. Looking for places to walk with your family and/or friends, or with your dog? Hoping to spend time in the outdoors on a trail that is handicapped friendly? Want to find a new place to walk that is right around the corner from where you live? Or maybe you have a canoe or kayak but don’t know how to find safe canoe launches. Find information to satisfy all these needs, and more, with maps to each trail head, in each of the books in the series."